As a wealth management firm specializing in retirement income planning, our most important task is to ensure we provide our clients with a complete financial picture and know their needs well enough to provide the necessary guidance and support. Many people are surprised that after a lifetime of saving and investing, the whole concept of shifting into the retirement mode becomes a challenge. Yet the transition into retirement isn’t the only phase a person goes through when gearing toward those golden years. That is why we developed a process called The Integrated Wealth Model. It is the basis of an ongoing collaboration with our clients that provides the groundwork that strives for a successful wealth accumulation strategy that takes into consideration the volatility of the market and develops a solution that seeks to both minimizes risks and builds wealth. We developed this model because we believe that there are many “financial advisors” that are expounding their own strategy for instant wealth accumulation, and are often off-strategy or don’t necessarily take the clients best interests in mind. It is important to remember that mitigating risks around a wealth accumulation strategy takes time. A well-diversified portfolio is a must, and so is the realistic expectation that you aren’t going to get rich at a young age. A knowledgeable advisor buys stocks and holds them for a determined period of time regardless of market fluctuations, and makes periodic adjustments to your investments that fall in line with your particular situation and comfort regarding risk tolerance. Though clarification and careful consideration, a wealth accumulation strategy can be accomplished to pursue long-term success. 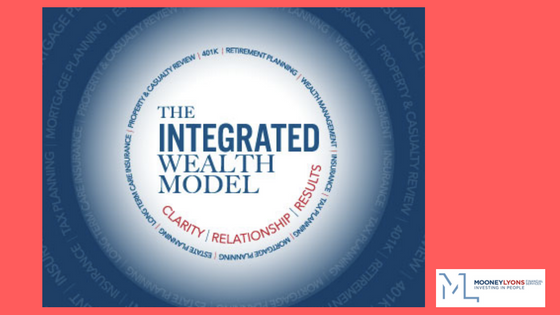 If you have questions about what you need to plan for regarding retirement savings or would like to know more about The Integrated Wealth Model from Mooney Lyons visit our website.